The Bastionul Graft dates back to the early 16th century and was built to defend and maintain the cost of the Seed's Guild- to the northwest of the main fortress. It was also used for communication between the different section of the fortress. 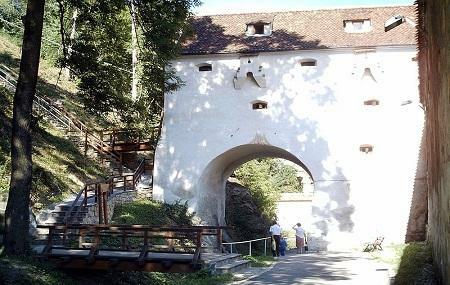 The Graft bastion was built as a bridge over the canal that would take the waters from the Schei river. The structure is 4 meters high and has holes for shooting cannons and firing guns. The supporting arches that you see today were added to the structure after a torrential rain weekend its support. Today, you can find a small exhibit here with weapons, armours used in war, tools, ammunition and old photos and documents that give you a peak into the role that the bastion played to defend the city. A very pretty bastion along the self-guided walking tour (there is a map). You can not go inside. Beautiful and calm place to have a walk. There is a connection with the White Tower. The museum isn't worth it.